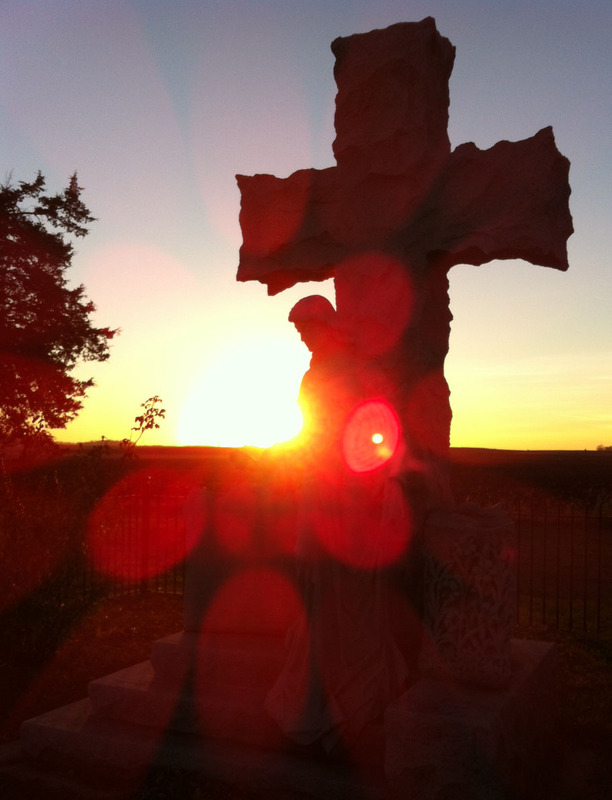 A sunset shot of the Milford State Monument. 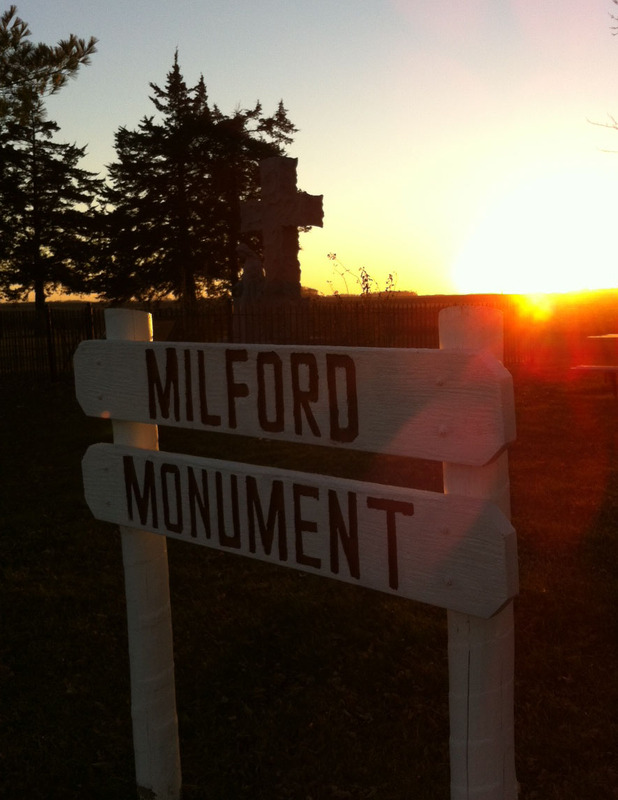 Just outside of New Ulm, Minnesota, sits the Milford State Monument. I had only heard about this monument; I had never been past New Ulm on County Road 29 until Wednesday, when I had to drive to a speaking engagement in Redwood Falls. 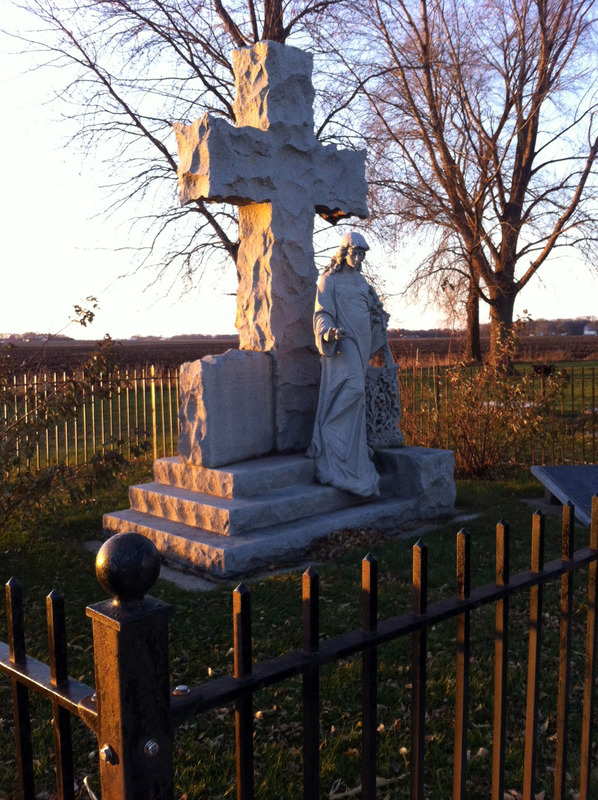 The monument marks the Aug. 18, 1862 killing of more than 50 settlers at the beginning of the U.S.-Dakota War. The settlement of Milford no longer exists. The closest town is Essig. The female figure is supposed to represent Mercury. The memorial was dedicated in 1929. My route from New Ulm to Redwood Falls. This drive was new to me, and the journey at sunset was unbelievable. I forget how flat it is once you get past New Ulm. I could literally see for miles. At one point, the town of Sleepy Eye was several miles away, but yet I could see the majestic twin spires of St. Mary’s Church. If you zoom into the map, you will see the Milford Monument about three miles outside of New Ulm, at the intersection of County Roads 29 and 11. 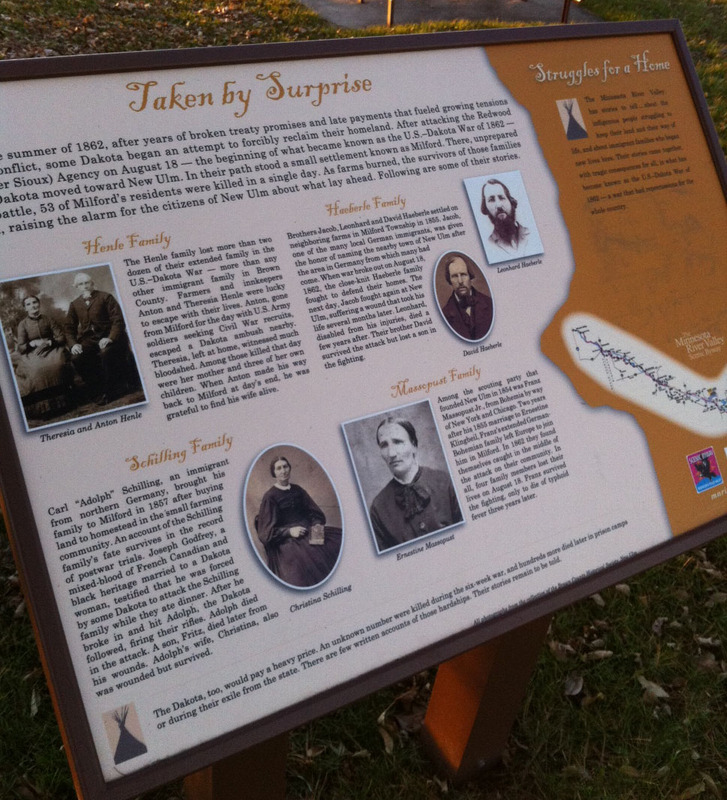 As this sign notes, the survivors fled to New Ulm to warn citizens there that the Dakota were on their way. If you want to know more about the war, check out this website. 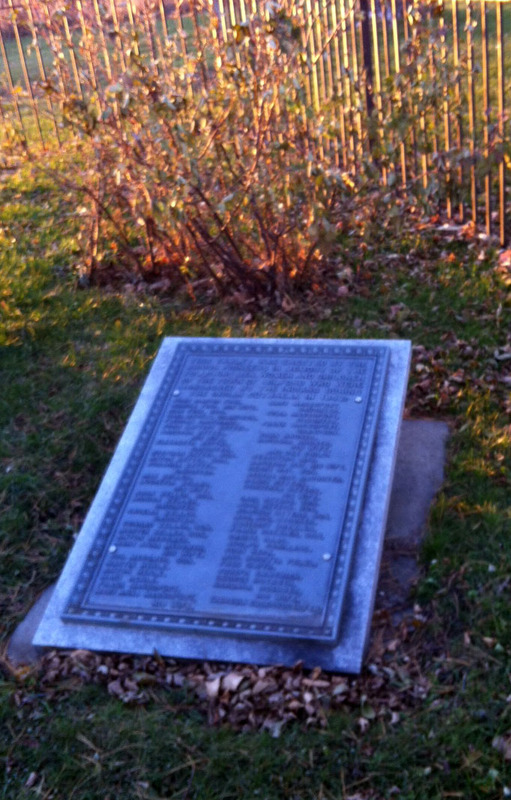 A plaque that lists those killed. Someone left a beer can behind. Classy. Because nothing says family picnic like the site of a massacre. 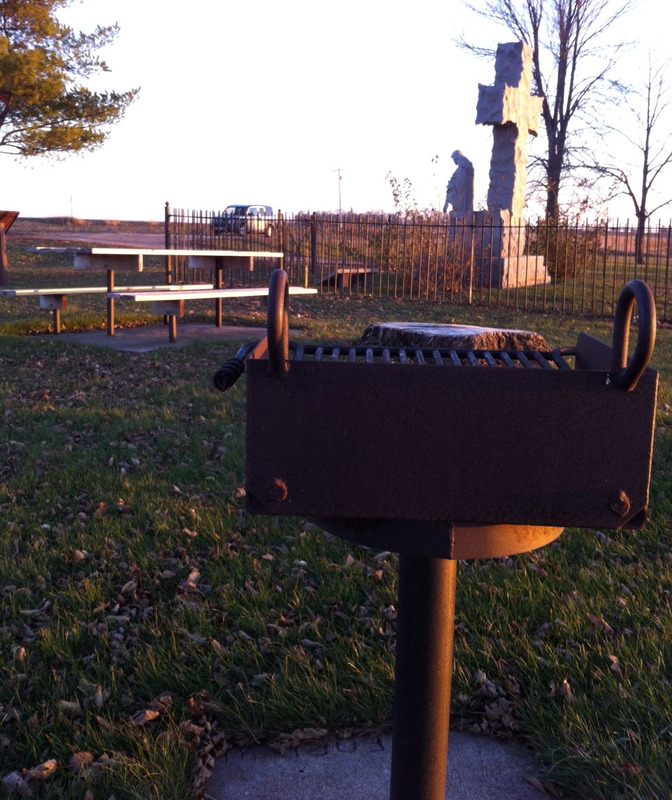 I found the presence of this picnic table and grill odd. The timing of my arrival at the Milford Monument was not planned, but it was perfect–about 10-15 minutes before sunset on a clear day. Brown County Road 29 has been my route for decades, driving from Faribault back home to Vesta, which is 20 miles west of Redwood Falls. Thus I am quite familiar with the Milford Monument. Once, I believe it was Memorial Dad weekend, I spotted roses lying at the base of the monument. It was so touching to consider that someone still cared deeply for those settlers all these years later. I photographed the scene. If you go to my Minnesota Prairie Roots blog and type “Milford” into the search engine, you’ll see that image and find several other U.S.-Dakota Conflict related posts. Just before you reach the monument, there’s a plaque along the road noting an ambush which occurred there during the war. And another new marker has been installed a bit further west, although I have not yet stopped to check out that one. Yes, the land west of New Ulm is flat. It is the prairie I so love and miss. 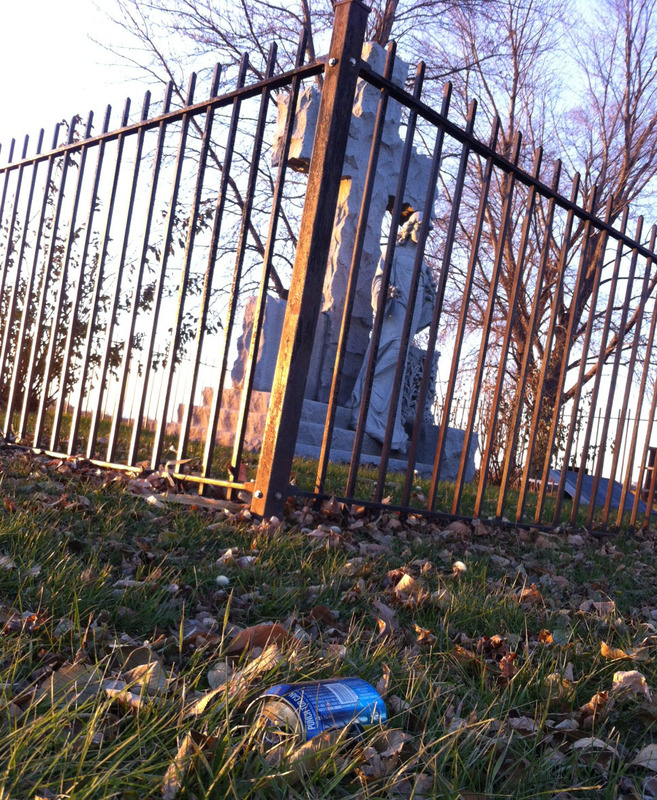 I was quite disheartened to see a beer can at the site instead of flowers. It is nice when people choose to remember in respectful ways. 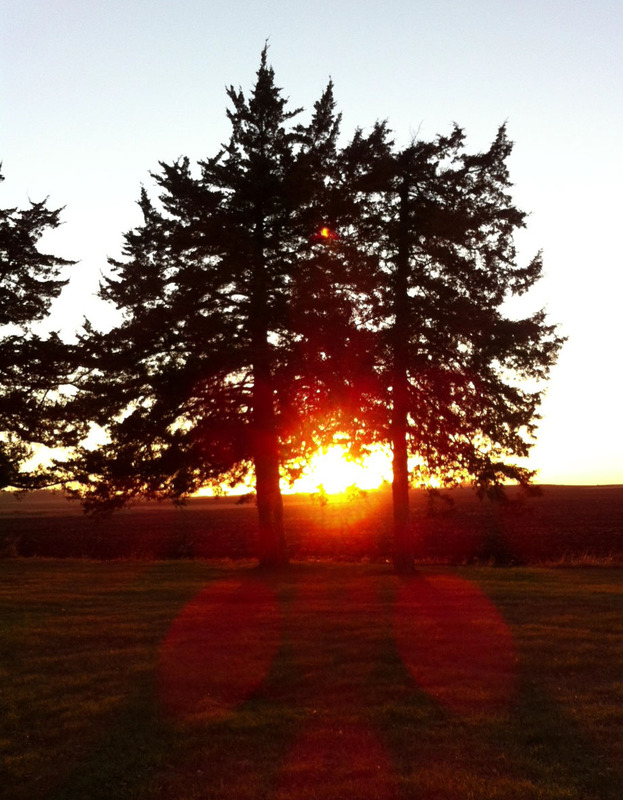 Going to “the prairie” reminds me how Waseca and Mankato are really at the edge of the “Big Woods.” The landscape is just different, with rolling hills and lots of trees. It must be wonderful to see a thunderstorm approach on the flat of the prairie, nothing to break that expansive view of the sky.